Over on YouTube Leif 'sm5bsz' has uploaded a video that does a lab comparison of various SDRs on the market now including the new Airspy HF+. Leif is known for providing excellent lab based technical reviews of various SDR products on his YouTube channel. The first video compares the Airspy HF+ with the Perseus SDR. The Airspy HF+ is a new high performance yet low cost ($199 USD) HF/VHF specialty SDR. The Perseus is an older high performance direct sampling HF only SDR, although it comes at the high price of about $1000 USD. In his tests Leif tests both units at 14 MHz and finds that the HF+ has about 15 dB better sensitivity compared to the Perseus (NF = 7dB vs 22dB). 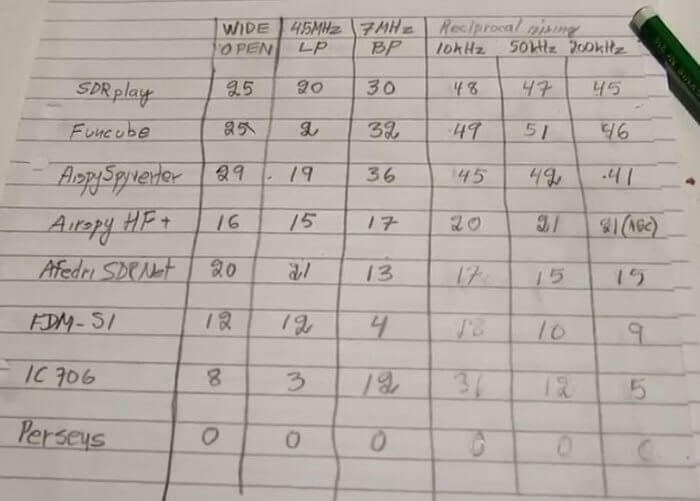 On the other hand the Perseus has about 23 dB better dynamic range compared to the HF+ (Dynamic Range = 127 dBc/Hz vs 150 dBc/Hz), although he notes that a blocking transmitter needs to have a very clean signal to be able to notice this difference which would be unlikely from Amateur transmitters. In the next two videos Leif compares multiple SDRs including the SDRplay RSP1, FUNcube Pro+, Airspy with Spyverter, Airspy HF+, Afedri SDR-Net, ELAD FDM-S1, ICOM IC-706MKIIG and Microtelecom Perseus at 7 MHz. In the RX4 video Leif compares each SDR on dynamic range at 7 MHz. If you want to skip the testing parts, then the discussion of the results in the RX4 tests start at 1:03:00. A screenshot of the results is also shown below. The SDRs are ranked based on their average results over multiple measurements at different times which is shown in the last column. A lower value is better, and the value represents how much attenuation needed to be added to prevent the SDR from overloading and causing interference in his setup. 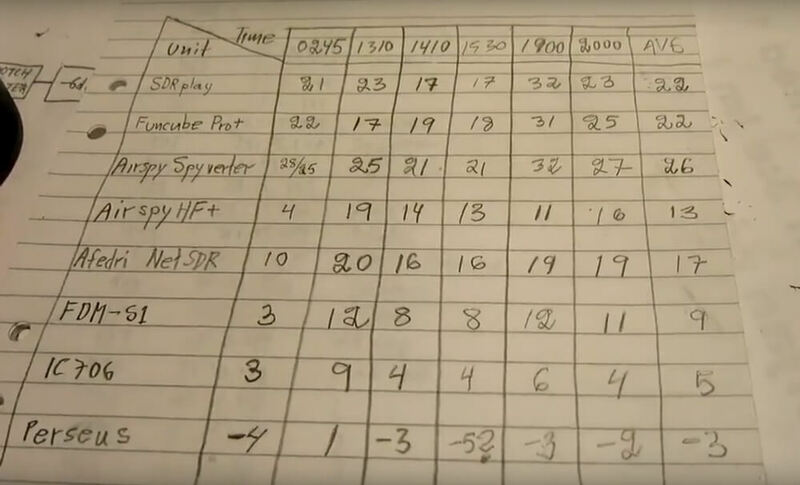 In the RX5 video the results start at 54:20:00. In this video he compares the SDRs with real signals coming in from his antenna at 7 MHz. He tests with the antenna signal wide open, with a 4.5 MHz LPF (to test out of band blocking performance), and with a bandpass filter at 7 MHz. Again lower values are better and the values indicate the amount of attenuation required to prevent overload. The Perseus is used as the reference benchmark. He also tests reciprocal mixing later in the video. Over on YouTube well known SDR tester Leif (SM5BSZ) has uploaded a video that compares the performance of several HF receivers with two tone tests and real antennas. He compares a Perseus, Airspy + SpyVerter, BladeRF + B200, BladeRF with direct ADC input, Soft66RTL and finally a ham-it-up + RTLSDR. The Perseus is a $900 USD high end HF receiver, whilst the other receivers are more affordable multi purpose SDRs. 24:06 – Two tone test @ 20 kHz. These test for dynamic range. The ranking from best to worst is Perseus, Airspy + SpyVerter, Ham-it-up + RTLSDR, Soft66RTL, BladeRF ADC, BladeRF + B200. The Perseus is shown to be significantly better than all the other radios in terms of dynamic range. However Leif notes that dynamic range on HF is no longer as important as it once was in the past, as 1) the average noise floor is now about 10dB higher due to many modern electronic interferers, and 2) there has been a reduction in the number of very strong transmitters due to reduced interest in HF. Thus even though the Perseus is significantly better, the other receivers are still not useless as dynamic range requirements have reduced by about 20dB overall. 33:30 – Two tone test @ 200 kHz. Now the ranking is Perseus, Airspy + SpyVerter, Soft66RTL, BladeRF+B200, Ham-it-up + RTLSDR, BladeRF ADC. 38:30 – Two tone test @ 1 MHz. The ranking is Perseus, Airspy + SpyVerter, BladeRF + B200, ham-it-up + RTLSDR, Soft66RTL, bladeRF ADC. 50:40 – Real antenna night time SNR test @ 14 MHz. Since the Perseus is know to be the best, here Leif uses it as the reference and compares it against the other receivers. The ranking from best to worst is Airspy + SpyVerter, ham-it-up + RTLSDR, BladeRF B200, Soft66RTL, BladeRF ADC. The top three units have similar performance. Leif notes that the upconverter in the Soft66RTL seems to saturate easily in the presence of strong signals. 1:13:30 – Real antenna SNR ranking for Day and Night tests @ 14 MHz. Again with the Perseus as the reference. Ranking is the same as in 3). In a previous video Leif also uploaded a quick video showing why he has excluded the DX patrol receiver from his comparisons. He writes that the DX patrol suffers from high levels of USB noise. 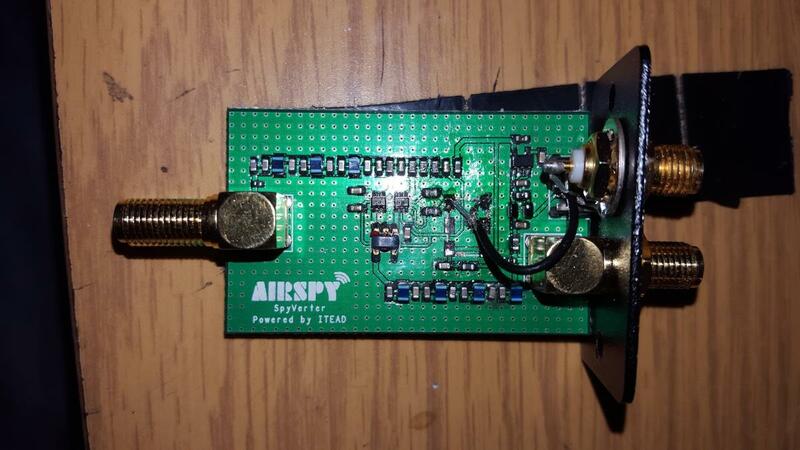 Recently Tim Havens (NW0W) wrote in to use to let us know about his work in connecting the Airspy and Spyverter to a very accurate GPS disciplined oscillator (GPSDO). Usually the drift on the Airspy and Spyverter is completely negligible, however Tim uses them together with his Yaesu FTDX-5000 for monitoring CW signals. He wanted to be able to click on a CW signal and have his FTDX-5000 tune to the signal perfectly every time, so even very small oscillator drift offsets could affect his tuning. To get a high accuracy clock signal from a device such as a GPSDO can be used for both the Airspy and Spyverter. Tim was able to find a very nice GPSDO from Leo Bodnar that comes with two clock separate outputs that can be configured to output any frequency between 450 Hz and 800 MHz. The Airspy already contains an external clock input for 10 MHz, however the present version of the Spyverter contains no such external input. To get around this Tim carefully removed the oscillator on the Spyverter and then added a second SMA connector to connect to the GPSDO. His final setup consists of the Leo Bodnar GPSDO outputting a 10 MHz and 120 MHz GPS disciplined clock signal that feeds the Airspy and Spyverter respectively. With this Tim found that he needed no initial offset and zero drift was noticed over two days of testing. Finally Tim also writes that this Leo Bodnar GPSDO could just as easily be used to create a 28.8 MHz clock signal for an RTL-SDR, or any other SDR or upconverter that needs it. Modded Spyverter with external clock input. The SpyVerter is a new upconverter that has recently gone on sale. It is created by Youssef (he programmed SDR# and worked on the development of the Airspy SDR) and Bob W9RAN (of rantechnology.com and youtube.com/user/ranickel). 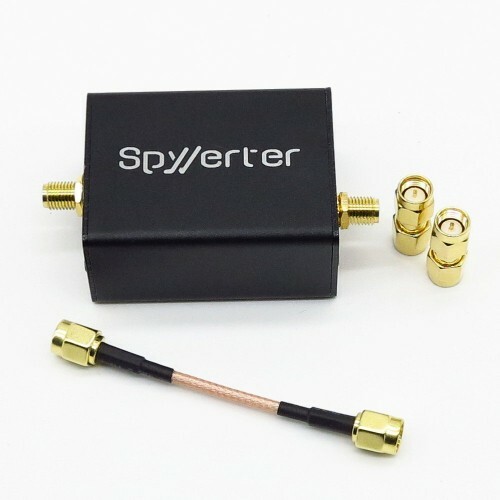 In this post we'll review the SpyVerter and compare it against some other up converters that we have used in the past. Radio transmissions between 0 - 30 MHz can travel all the way around the world. At these frequencies many interesting signals such as international shortwave radio, ham radio communications and several military transmissions exist. The RTL-SDR's lowest tunable frequency is 24 MHz, and so it can only receive a small portion of the interesting transmissions that occur between 0 - 30 MHz. In order to listen to frequencies below 24 MHz an upconverter is required (either that or perform the direct sampling mod). An upconverter works simply by shifting these lower frequencies up to a higher frequency that the RTL-SDR can receive. For example, a 5 MHz signal might be upconverted to 105 MHz. To date, most decent upconverters (such as the popular ham-it-up upconverter) have been based on the double balanced mixer architecture implemented by the ADE-1 mixer chip from Minicircuits. The SpyVerter on the other hand is based on a different type of architecture which is inspired by the H-mode mixer design that was used in the unreleased HF7070 communications receiver. The expected major advantage that this design has over a ADE-1 based design is better IIP3 performance. This essentially means that strong signals will not cause overloading issues in the SpyVerter, meaning less noise and spurious images. Another advantage of the SpyVerter is its use of a 120 MHz low phase noise/low jitter clock, meaning less reciprocal mixing and thus greater SNR and a lower noise floor. A low phase noise clock is essential for getting good performance when receiving the very narrowband signals that are typically found between 0 - 30 MHz. The other upconverters do not specify their phase noise performance as far as we can tell. The SpyVerter comes in a metal box, with three SMA adapters. A metal box is great because it helps keep strong interfering signals from entering the signal path, as well as stabilizing the internal temperature, keeping frequency drift to a minimum. Most upconverters only come with a metal box as a paid add on, but the SpyVerter comes in one by default. Although the SpyVerter is designed to be used with the Airspy, it is fully compatible with the RTL-SDR as well. The SpyVerter can be powered via a USB cable, or via 5V bias tee (and this is compatible with the bias tee used on the RTL-SDR Blog units sold by us). The SpyVerter in enclosure with bundled adapters. The team behind the Airspy software defined radio (as well has the popular SDR# software package) have just released the SpyVerter upconverter for sale. Upconverters shift HF frequencies (0 – 30 MHz) “up” by a fixed amount, giving receivers that can’t tune that low like the RTL-SDR and the Airspy the ability to receive HF signals. The SpyVerter extends reception all the way down to DC and has a 60 MHz low pass filter. Its main selling point is its H-Mode architecture which provides excellent IIP3 performance. This basically means that strong HF signals are unlikely to cause overloading in the up-conversion stage. The good IIP3 performance should improve HF reception when compared to other upconverters even with lower end SDR’s like the RTL-SDR. The reason is that when hit by strong HF signals many other upconverters will overload in the upconversion mixing stage, before even reaching the SDR, thus requiring the need for attenuators or antennas with less gain. Another selling point is its good performance down to DC, making it ideal for VLF reception. SpyVerter is designed for optimal performance with the Airspy and can be powered directly by the Airspy’s bias tee. 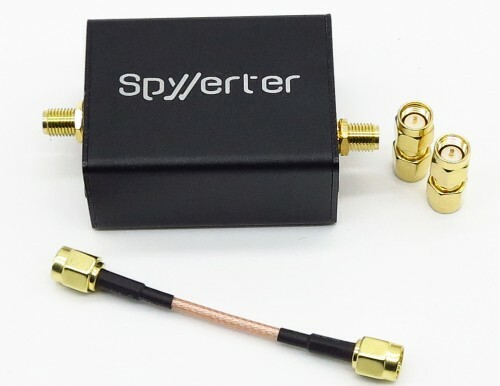 However, RTL-SDR users can also use the SpyVerter by powering it through the micro USB connector, or by using it with one of our RTL-SDR Blog units with the activatable bias tee. The SpyVerter sells for $59 USD and comes in a metal enclosure with three bonus SMA adapters. There is a $9 USD discount for Airspy owners. At these prices combined with its claimed performance and metal enclosure we now generally recommend the SpyVerter over any other upconverter. The designers of the SpyVerter have sent us a sample unit and we will review it after testing it out over the next few weeks, but our initial tests already show good performance.